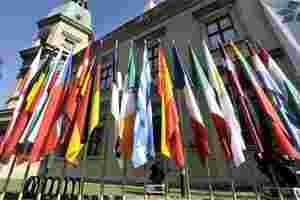 Berlin: Last week’s European Union (EU) summit went a long way towards forging the closer economic ties needed to prevent future debt crises but markets are likely to judge it as too little and too late to solve the current one. As on previous occasions, the measures are unlikely to calm investors for long. EU leaders ended the summit with a historic agreement to draft a new treaty for deeper integration in the euro zone, but analysts and policymakers remained skeptical such long-term steps could solve the crisis that has shaken Europe for two years. Stock markets rose on Friday as the summit drew to a close but Italian borrowing costs came under further upward pressure. Price action in the coming week will deliver a more considered verdict. “The moves by the euro zone policymakers are not a damp squid but neither are they the big bazooka hoped for that could really ease market tension for an extended period," said Howard Archer, economist at IHS Global Insight. The euro slipped in Asia on Monday as investors took the view that the EU plan was not the decisive move needed to resolve the debt crisis. EU leaders agreed to lend up to €200 billion to the International Monetary Fund (IMF) to help it aid euro zone strugglers, and to bring forward the permanent rescue fund European Stability Mechanism (ESM) by a year to mid-2012. Those steps, together with a leveraged European Financial Stability Facility (EFSF) - the existing bailout fund - are intended to boost help for troubled euro zone countries, such as Italy and Spain, the bloc’s third and fourth largest economies, as they muddle through their refinancing crunches. Italy alone has €150 billion in debt falling due between February and April of next year. However, it is still months until the ESM comes into force and few international investors seem keen to pay into the EFSF. Add to that the Damocles’ sword of a Standard and Poor’s rating downgrade hanging over euro states, which would also likely prompt a downgrade of the EFSF’s credit worthiness, and the available funds could well fall short of needs again. S&P’s statement that its review was due to end “as soon as possible" after the summit is likely to keep investors on their toes this week. “The pattern of previous EU summits seems to be repeating itself. Prices increase ahead of the summit, only to crumble afterwards," said Markus Reinwand of Helaba. Indeed, Moody’s Investors Service reiterated that it would complete a review of ratings on EU sovereign debt in the first quarter of 2012. “The communique offers few new measures, and does not change our view that risks to the cohesion of the euro area continue to rise," it said in a weekly credit report. Further dampening investors’ confidence, many of the summit’s decisions still need to be approved in national capitals, something that has proved a challenge in the past for leaders returning home from tough talks in Brussels. “A lot of uncertainty remains. Most of all we have to implement quickly what was agreed," German finance minister Wolfgang Schaeuble told public broadcaster ZDF. “We’ve got to work on that with high urgency. We can’t go into our Christmas break already." Such uncertainties include the plan to push forward the ESM, writing the new fiscal rules into national law and details on how to fork out up to €200 billion for the IMF to boost its crisis-fighting arsenal. In Germany for instance, the size of its contribution to the IMF loans has not yet been fixed. The government and central bank aim for a conclusion in the coming week, but it remains unclear whether those countries already receiving euro zone aid will contribute or how to deal with a shortfall if they don’t. “I suspect events will overtake us over the next few weeks. Fiscal co-ordination is a good idea, and it’s good that’s happening, but it’s not going to be enough to solve the problem that we have," Irish transport minister Leo Varadkar told national broadcaster RTE. Outgoing European Central Bank (ECB) chief economist Juergen Stark, who sources say is quitting because of his opposition to the ECB’s bond-buying programme, was quoted as saying in Monday’s Sueddeutsche Zeitung that greater involvement of the IMF would be “an act of desperation". “Hardly anything has been carved in stone, the bazooka is a tripartite conglomerate of smaller fire weapons and national decision-making processes could still spoil (the) plan," said Carsten Brzeski, economist at ING in Brussels. “It’s not over yet but the euro zone is on a good way towards a fiscal compact and saving the euro." Italian and Spanish bond sales will mark the first big test of post-summit market sentiment next week, with Rome expected to pay a record cost to borrow. Germany, Europe’s benchmark issuer, also auctions two-year Schatz notes. A first indication will come from short-term debt auctions on Monday and Tuesday by Italy, France and Spain ahead of the more challenging bond sales. “The (chance of Italy and Spain) currently being able to fulfill those funding commitments in the first instance, and secondly at yields that are not prohibitive, is looking unlikely at the moment," said Michael Derks, chief strategist at FXPro in London. Barring a swift return of investor confidence after what had been branded as the “make-or-break" summit, all eyes remain on the ECB. Its future role was left largely unanswered by the summit and Germany has led opposition to the ECB effectively bailing out governments. Analysts expect the ECB to play a role in supporting the market to ensure a smooth outcome of next week’s debt sales but the central bank has ruled out moving beyond its comfort zone. ECB president Mario Draghi, speaking just hours before Friday’s summit, doused hopes of greater involvement. ECB sources told the news agency the central bank would stick with its self-imposed cap of a maximum purchase of euro zone sovereign bonds of €20 billion a week - a level of buying it has hardly ever got near - for now and was not considering bigger action in response to the summit decisions. On Saturday, Bundesbank chief Jens Weidmann said monetary state financing remained prohibited in Europe and reiterated his opposition to common euro zone debt issuance, another measure Germany fiercely opposes. But Italian Prime Minister Mario Monti said on Sunday Germany and other countries would eventually be convinced that commonly issued euro zone bonds were a useful way of tackling the region’s debt crisis. French suggestions that commercial banks, now able to draw on three-year liquidity lines at the ECB, could step up their purchases of government bonds also look optimistic given the same banks are being asked to deleverage and recapitalize if necessary. “The ECB has still got room to step up its purchases to a significant extent, but markets will remain concerned that it did not commit to an enhanced role in resolving the crisis, especially after speculation in this regard fuelled by Mr Draghi himself," said Luigi Speranza at BNP Paribas.